to focus as much had piled up since my last zero in Pagosa Springs. In the picture above, I have the care package items from my latest resupply. I have my Doritos and Mountain House from Katy and Chad, yay! My Reeses’s from my aunt Edie and Uncle George, score! 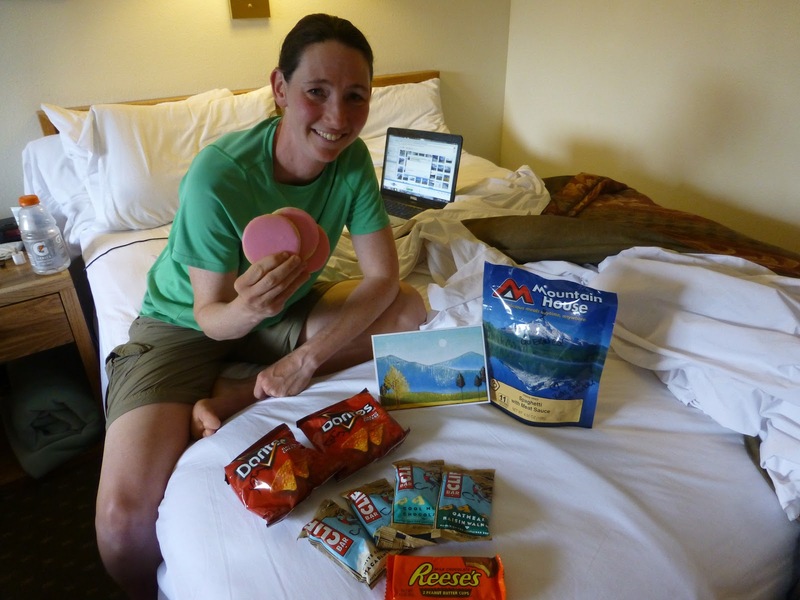 A wonderful card from my friend Heart who hiked the PCT last year, aww! Plus, this leg’s supply of Clif Bars from Corinna who has supplied me a month’s worth of Clif Bars, whoa! As for the cookies I’m holding, these “pink cookies” were the surprise of the box…when my sisters and I were little, we would get to go to Cristaudo’s Bakery for a special treat and that would be pink cookies. My dad moved back to Southern Illinois in the past year and managed to send me some pink cookies! These really bring back some great memories and took me right back to childhood. What a great surprise that I never saw coming! Thanks everyone for your care package items. It is really fun and encouraging to get these little surprises. As for today, I seriously sat on this bed most of the day and it was wonderful! Rockin’ woke up at 5:30am since we are usually on trail at that time or getting ready. Once she got up, we were both up and couldn’t fall back asleep. Neither one of us sleep much as we were up til midnight last night. We went down to the continental breakfast and I did my best to stuff as much food in me as I could. Then I went upstairs and did blogging, video loading, a slideshow from the last section, emailing, phone calls, and multiple Skype calls. My one venture out of the room was down the street to grab Subway for lunch. I drank a ton of whole chocolate milk today and ate leftover pizza from last night too. As for dinner, Rockin’ grabbed me a microwave pasta dinner at the grocery store. A true zero day and great rest for my body.